EXAIR’s 2015 Year End Review! In case you were too busy to notice, it’s 2016! With the start of the new year I would like to review just a few milestones EXAIR reached which will help continue to serve our customers and provide solutions to manufacturing problems. The year was extremely busy for us and so far, 2016 is looking to be even better. Throughout the course of the last year EXAIR has released hundreds of new products. We continue to increase our Atomizing Spray Nozzle product line and we received the official patent on our No Drip Atomizing Spray Nozzles. The No Drip versions of our spray nozzles have a patented design which helps conserve precious liquids, including water, while also preventing drips which could affect your product finish. Our new line of Back Blow nozzles have been created to clean the inside of pipe, tube, hose, channel or shafts and prevent the operator from pushing debris further inside by directing the airflow and debris back out toward the nearest end. We have also outfitted our air guns with these nozzles to provide an easy to activate and ergonomic solution. EXAIR also expanded our swivel fitting, air operated conveyor, industrial housekeeping and Cabinet Cooler product lines. See our website for more information on these products. These new stock products ship same day on orders received by 3 PM EST for orders within the United States. Custom products helped solve problems for hundreds of customers with manufacturing solutions that just didn’t quite fit the bill of our off the shelf products. Since we are a manufacturer (located in Cincinnati, OH) we have the ability to modify stock products, create custom solutions, provide timely information and fast lead times for special products. We blog about specials a lot and we continue to help customers with custom fit products that will surpass their expectations. With all of the new products and customs, we continued to achieve higher levels of shipping accuracy. We now have a 20 year streak of shipping complete, on time, correct orders if over 99.9%! 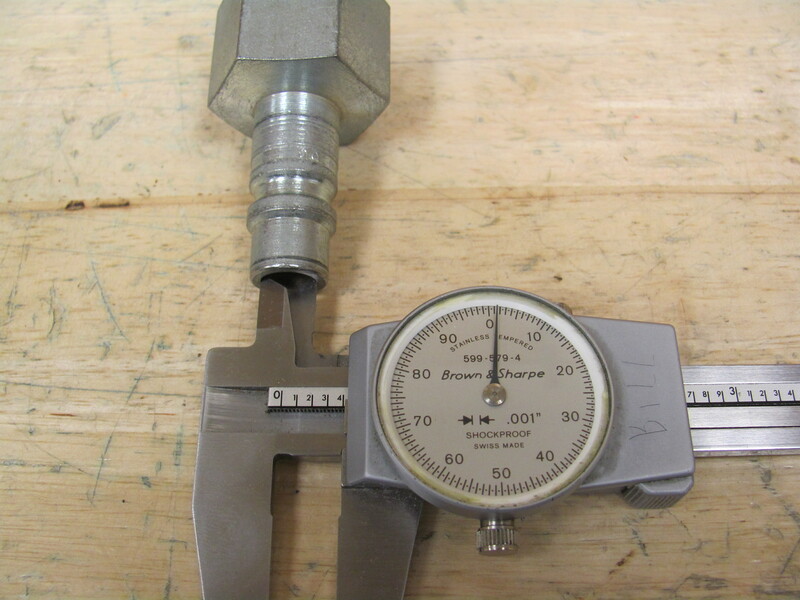 There are not many companies that I deal with on a personal level or through EXAIR which can claim their accuracy is this high. When we weren’t shipping orders or helping customers with custom solutions we also managed to post more than 1 blog per business day, I don’t even want to count the thousands of other Social Media posts we have done, and released numerous videos of tips and tricks for many of our products. The message I am trying to get across is that we press forward here at EXAIR. We are constantly making moves and trying to ensure that we offer our customers every item they may need, in a timely manner, correctly, of high quality, and easy to do business with. That is the only way that we can continue to be the best company for Intelligent Compressed Air Products! What Exactly Does “Easy To Do Business With” Mean? That’s the goal – we want it to be easy for you to do business with EXAIR. I understand this is not exactly a quantitative expression, and everyone here likes to have data to back up our claims. Well, here are just a few ways that I have found to verify we are easy to deal with. Whenever you call in, the phone is answered by a live person. This of course is true for Monday through Friday from 8 AM to 5 PM EST – what most of us consider “normal business hours”. The team that answers the phone is also our Order Entry team who can help with pricing, some general product questions, lead times, freight quotes, etc. And, if you need additional technical information or an expert to assist you with implementing a solution for your problem, they are the team who will pass your calls on to my team, the Application Engineers. We have a full staff of Application Engineers who are here to assist with selecting the right product to fit your needs and troubleshooting existing compressed air setups. Our Application engineers are experts at determining how much compressed air can be saved compared to an existing setup and how that translates into your dollar savings. They understand how important it is to you to keep your processes OSHA compliant and personnel safe. Our Application Engineers also walk you through any returns which may occur with our 30 day trail period, which brings us to the next topic. We honor a 30 day guarantee on stock products. This permits you to get the product in to your facility and put it through the paces and if it doesn’t perform to your standards, give us a call. We will take the item back and issue you a full credit for the purchase price of the product. I should probably state at this point that – Yes, we do deal with applications we have not dealt with before. In these situations we remain confident in our recommended solution (or we would not have made it) but will remain close to you as the installation and implementation occur just so we can help troubleshoot if necessary. If it ends up not working – see the first 3 sentences. On top of all those, we stand behind our product with a 5 year built to last warranty for compressed air products, and a 1 year warranty on electronic components. This just goes to show how strongly we believe in our workmanship and our products. In case you have never called or sent in an inquiry from one of the numerous ways we offer to contact us, please do. I can assure you that you will receive a timely response from a live person that will give you the best answer possible. If we don’t have the answer, we’ll tell you and many times we will offer a good place to find a solution. Quick Disconnects are a quick and easy solution to hook up devices to your compressed air system. These units can be found in quite a few factories and are more often than not being used incorrectly. I know that on the air compressor in my garage, the only way to hook anything up to it was to use 1/4″ quick disconnects. Chances are they are even a few of them within your facility, assuming you have compressed air available. 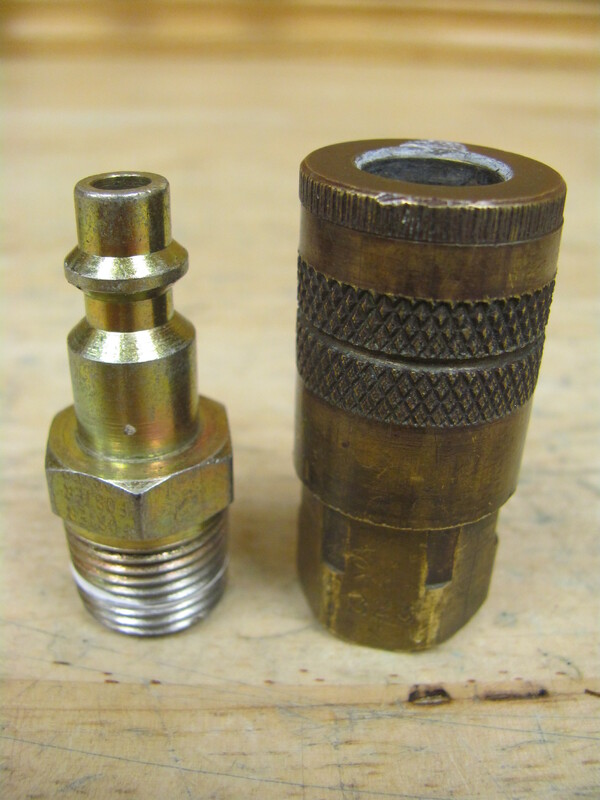 1/4″ Quick Disconnect male and female. When you really look at a quick disconnect though you start to see why it shouldn’t be used to install every compressed air driven device there is. 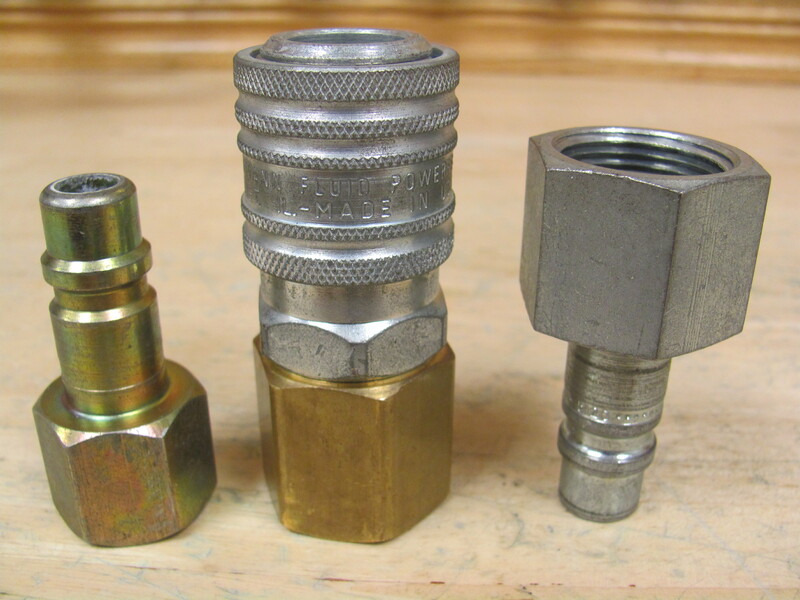 You can see in the pictures below that a 1/4″ quick disconnect that goes to a 3/8″ NPT adapter has a .192″ opening at the small end. A 3/8″ Schedule 40 iron pipe will actually carry a .493″ inner diameter. If you were to use this quick disconnect on something like a 2″ Heavy Duty Line Vac, you will starve it for air due to the limited ability of the small diameter to carry enough air volume. This, in turn, will limit the performance of the Line Vac. This is because the through hole on the quick disconnect cannot pass enough air to feed through to the Line Vac. Inner Diameter of 1/4″ quick disconnect. On the 1/4″ quick disconnect to a 3/8″ NPT this may not be as large as a problem as the next picture. Below you can see a 1/2″ quick disconnect that is going up to a 3/4″ NPT. a 3/4″NPT Schedule 40 iron pipe is actually a .824″ inner diameter. The quick disconnect at most has a .401″ inner diameter. Inner diameter of 1/2″ quick disconnect. Even though you are providing the correct thread size for your connection (a 3/8 MNPT and a 3/4 FNPT respectively in our example) the quick disconnect’s small inside diameter could be too much of a restriction for the volume demanded by an end use product. Due to this restriction point you will see pressure drops in your system when using a device with a properly sized inlet for its demand of compressed air being fed with an improperly sized quick disconnect. 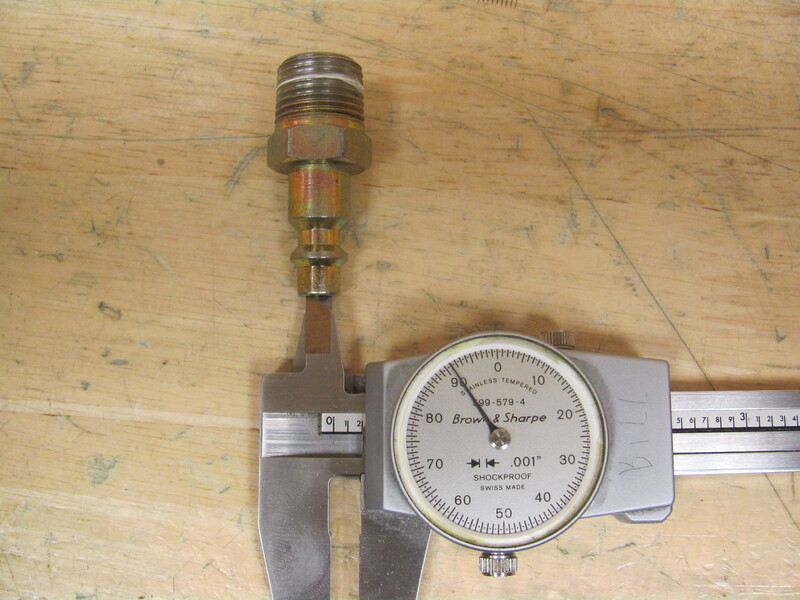 This is one of the main reasons one of our first questions in troubleshooting an EXAIR products performance with a customer is whether or not they are using quick disconnects. If you would like to learn more about how to properly plumb your EXAIR Intelligent Compressed Air Product, feel free to contact us, or take a look around our Knowledge Base.